Long delays on the M1 this afternoon following a fuel spillage. Picture via Highways England. 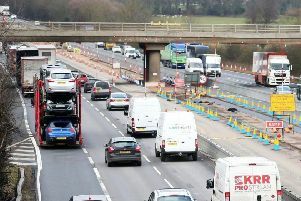 Drivers are facing delays of around 80 minutes on the M1 this evening. Highways were forced to close two lanes of the M1 northbound between junction 14 for Milton Keynes and junction 15 for Northampton earlier this afternoon following an accident involving a lorry. The vehicle and diesel spillage has now been cleared but long delays remain, with drivers advised to find alternative routes. A spokesman for Highways England said: "The vehicle involved in the earlier collision has now been recovered and the spillage of 300 liters of diesel has been cleared from the carriageway. "Residual delays of 80 minutes remain on the approach."